The month of march marks 149 years since the death of Morena Moshoeshoe, king of the Basotho nation who is credited as its founder. 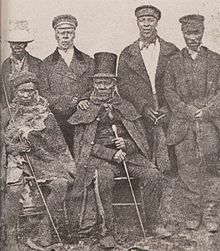 Moshoeshoe was born Liphoqo or Lepoqo - depending on which historian you are reading - at Menkhoaneng in the present district of Leribe, 1786, and formed the Basotho nation in the early 1820s. What makes Moshoeshoe special was his style of leadership, which for the missionaries who recorded him was atypical, but was in fact probably the norm of a bygone era - even in those days. It was his ethical leadership which made him loved and revered by the Basotho people, even today. Early in life, Moshoeshoe already perceived the disadvantages of the old system of tribal independence; seeing in it possibilities of abuse of power by a multitude of chiefs with no central overlord, and, more important still, a lack of cohesion in resisting a common foe. Along with his age-mate and right hand man, Makoanyane, he had already conceived the idea of federating all clans and tribes, and establishing a uniform code of law and equity among them. In this, Moshoeshoe was already thinking of ways towards an African democratic political system based on the philosophy of Botho/Ubuntu. Using botho, already an ethical philosophy captured by the proverb motho ke motho ka batho, Moshoeshoe sought to forge a prosperous nation based on the principle that “Morena ke Morena ka Setjhaba”. This mirrors the Sesotho sa Leboa adage that ‘Kgosi ke kgosi ka batho’. This means that king is a king by the grace of the people, not that of by God as is the case in Western thought. Mogobe Ramose puts it more eloquently when he says “to be a king is to accede to that position because of the consent of the people and to remain so for as long as the people have not withdrawn from their consent. This is a fundamental element of traditional African constitutional thought”. Working on the basis of this philosophy, Moshoeshoe forged a nation out of the turmoil of lifaqane and unified different refugee tribes into one nation of the Basotho. Of his ethical acts still surviving in blurred memory of history, he is remembered to have shown compassion even as a young warrior, when he persuaded the tribal court to forgive a cattle-thief at the expense of his own standing as a warrior. His actions brought into question even his own loyalty to the clan. He allowed his followers to appeal to Lekhotla against his own decisions, prioritising consensus as an element in his leadership. Consensus is an inherent feature in the African Democratic tradition. Moshoeshoe also took the saying motho ke motho ka batho even further when he took a strong public stand against the killing of supposed witches. In another instance, with extraordinary skill and courage, he set free Rakotsoane, the cannibal chief and his band that his people clamoured for revenge for eating his grandfather, Peete. With a remarkable lack of resentment and tongue-in-cheek response, he merely observed that it was not customary to disturb the graves of one’s ancestors. Moshoeshoe was an astute thinker and could, better than most chiefs of the time, implement the suggestions of botho culture. For example, he used the kgomo tsa mafisa system to stave off poverty. In this system, a wealthy subject, or the king himself as he had many cattle, borrowed a subject in need one or two cattle to use for milk or breeding to raise young calves. It is then incumbent for the receiver to return the cow/cattle to the chief and to afford the same kindness to another person in need in future. It is an indigenous loan system which does not feature a Western Capitalist notion of Interest. It’s a loan system demanding zero interest upon return. Furthermore, Moshoeshoe restored an age-old tradition called Letsema, where working groups were formed to work in the fields for fruits, vegetable, and grains to ensure the supply of food. He also insisted on working on rival fields (tshimong tsa lira) as they invariably share the same food, especially in times of crisis like war times. All the while, Moshoeshoe was fending off rival tribes, colonial invasion by the Dutch and British and forging relations with French missionaries. It is truly remarkable then that during all of his reign in his fortress of Thaba Bosiu, he never lost a battle, not even against Shaka, Mzilikazi nor the mighty British military troops. His prowess as a diplomat, military strategist and fierce warrior are well documented, but it is his ethical leadership and philosophy which need to be taken seriously. In times when Africa struggles for proper leadership, Moshoeshoe is a leading example of how leadership centered on the concept of responsibility more than power can look like in an African context. Becker, P,1969, Hill of Destiny: the life and times of Moshoesh founder of the Basotho Nation, London: Longman. Sanders, P. 1975, Moshoeshoe–Chief of the Sotho, London: Heinemann.